What a find this Ranch style home over full walk out basement consists of 3276 total sq. 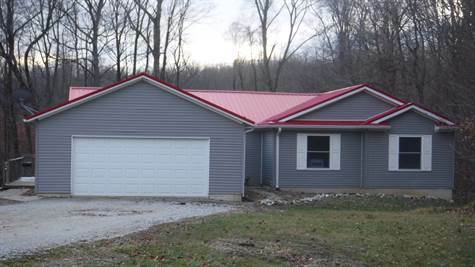 ft., 5 Bedrooms, 2.5 Baths, plus it sits on 21.25 acres in Northern Owen County. The mail level has a nice entry, a wide hallway to bedrooms and baths, the living room opens to the dining area and then to the kitchen. The full walk out basement has a utility room, storage room, office, 2 bedrooms, ½ bath and a large family room. There is a side deck that wraps around back & a 2 car attached garage on the home. The home is heated by an outside wood boiler plus it has an electric furnace for back up and central air. The 30x50 outbuilding has an additional 12x50 lean to, this whole building has a mixture of uses from animal usage, to storage with the additional workshop/detached garage which offers heating from the wood boiler. Recent updates include flooring, paint and a new metal roof. The 21.25 is mostly wooded with trails made for walking or riding, partial fencing for livestock and a small stocked pond.